North Carolina Gov. Pat McCrory, in an interview aired yesterday on a Charlotte radio station, downplayed cuts to unemployment benefits caused by made this year to the state’ s unemployment insurance system. The state, through legislation signed into law in February by McCrory, did cut both the length of time a person can collect unemployment (reduced from six months to a sliding scale of 12 to 20 weeks) and also cut the maximum weekly benefit from $535 to $350 a week. The cuts were part of an extensive plan to repay more than $2.6 billion the state unemployment insurance system borrowed during the height of the recession. 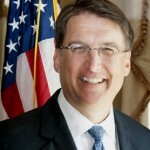 The July 1 effective date of those reductions, in turn, made North Carolina the only state to turn down federal extended unemployment benefits, which the federal labor department estimated would have provided more than $700 million in help through the end of the year to 170,000 long-term unemployed workers. McCrory spoke about the changes made in a law he signed earlier this year in an hour-long interview Monday with Mike Collins, the host of WFAE’s “Charlotte Talks” program. (Click here to listen to the entire interview). McCrory also discussed the decision to not expand Medicaid, a potential raise for teachers next year and his rocky relationship with the capital press corps, among other topics. When asked by Collins about whether, his July delivery of a plate of cookies to abortion rights protestors outside the Governor’s Mansion was a good idea in hindsight, McCrory remarked he didn’t care. Calls to McCrory’s press office for clarification about his statements on the radio program were not immediately returned. This post will be updated when we hear back. In the interview, McCrory also characterized the unemployment changes as a decision to not extend benefits beyond 90 weeks, a benefit that the state system never provided. The state system previously allowed for up to 26 weeks, or six months, with federal funds extending that amount of time during the recent economic recession. WFAE also noted in a post Monday afternoon that McCrory was wrong in Monday’s interview when he said that IBM and his former employer Duke Energy are no longer offering their employees health insurance because of the federal Affordable Care Act. Both companies are still providing health insurance to staff, but have changed the way retirees’ health insurance is handled. When my daughter was 5 she tried to re-write history thinking it would make it so. Guess what? It didn’t work then and it won’t work now. He didn’t take away unemployment benefits, he just compacted them…..
90 weeks, 19 weeks, what’s the difference? ‘Who cares?’ — definitely not the Governor. How often does our Governor have to “misspeak” before he is regarded as (a) an imbicele, and/or (b) a blatant liar? If it was just a once-off event, it could be excused, but how many times has he done something like this? This guy is well out of his depth. Ok. Enough. What is the process that the citizens can petition to remove this jerk from office. I’m done. Anybody else? I believe it is the goal of the GOP/Art Pope and his puppet McCrory to drive educated, skilled workers OUT of the state and leave it for their wealthy donors and the idiots that will only be smart enough to work at Walmart and Chic-fil-A. Well, here’s one more person leaving as of next year. What a cesspool this state is going to be soon. I do believe they’re looking to create a neo-nazi Nirvana, North Teabagistan. How is this man still in office? What an embarrassment for our state. When did the Governor start taking ignorant pills? Is it from the same source as the entire Republican Party? He’s got so little time to completely snafu our entire state and especially those who voted for him.